I have had a hectic few months, and have had very little time off, so when I was able to secure two weeks of leave I decided to take a holiday. And for a young, hip, penguin-on-the-go, there is only one place for me: the ancient civilisation of Egypt. Egypt has many sights to enjoy, both old and new. The first place I visited was the new library building at Alexandria. Most of the books they had there were human books, but I asked the tour guide if there were any others, and I was really impressed with the range of penguin books they had. After the Library, I visited the temple at Luxor. It was an impressive complex, and I took plenty of pictures to show the folks back home. One thing to watch out for is the heat. I am built for living in Antarctica, not hanging round a desert near the equator. If you are going there, remember to pack a hat and never leave your hotel without a bottle of water and a backpack full of ice. 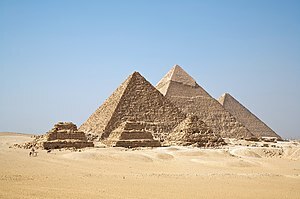 On my last day I visited the famous Giza Plateau to see the pyramids. I had a great time skiing down them, and everybody cheered as I went past, although I think one or two of the locals had never seen a penguin on skis before and the seemed distressed by it for some reason.